Postcard is 3.45 X 5.43 inches. 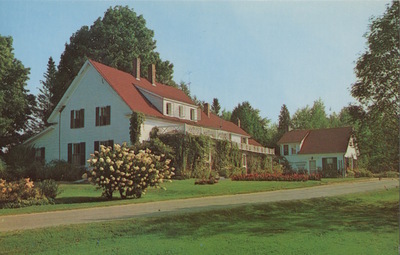 Back of card reads "Maine Chance Farm, Mt. Vernon, Maine. Photo by Longley Studio, Waterville, Maine. Made by Dexter, Nyack, N.Y.
Postcard series courtesy of Stephen Tufano, whose parents purchased the main house and adjacent grounds in 1970. Exact date of postcards is unknown.